When f.lux is active i.e. after sunset and I watch a YouTube video fullscreen, highlights appear "blown out" and render in strange colors (e.g. very bright pale magenta) and the mouse cursor has a blue fringe around it. Seconded, happens on Youtube and Netflix both (maybe more, haven't tested). Happens only fullscreen once my mouse fades away, and once I jiggle the mouse the blown out artifacts disappear... until my mouse fades out again. No issue with Chrome, just Safari. We have had many reports of this on Intel Iris (the drivers have always seemed to mess with video color settings), but the issue with HD4000 is new. Does the driver have any video-specific color settings that you can see? Where would I check that? Happens me in QuickTime too. "and once I jiggle the mouse the blown out artifacts disappear... until my mouse fades out again"
This also happens to me but, I have the Intel HD 4000 graphics card. My macbook pro is a mid 2012. I'm also running the current version of Yosemite and Safari. +1 for this. see it all the time when watching videos on my 2015 MacBook Air with Intel HD Graphics 6000. certain patches pixels become very bright for some reason. seems to only happen with moving video, never with pictures or regular UI. weird stuff! This happens on the new MacBook with the Retina display (Intel HD Graphics 5300 1536 MB), as well. It happens with full screen HTML5 video (so YouTube, Netflix, Twitch on Safari) when nothing else is displayed on the screen (e.g. it doesn't happen when video controls are visible). It does not happen in full screen videos in Chrome's flash player in the same scenario. It happens in Quicktime when playing a video downloaded from YouTube. It does not happen when playing the same video with VLC. I think a common pattern might be retina displays – it seems to me that videos look a little sharper in Quicktime and Safari than they do in VLC and Chrome. Perhaps there is a boundary sharpening filter that's supposed to make things look better on the retina display that messes with however flux works? Thanks for the additional info. We're trying to track it down and get it reported to the right place for a fix (it probably isn't happening in f.lux, it is just extremely visible with f.lux running). Current challenge: Can anyone repeat this in Chrome browser? We have reported this issue to Apple. I suspect it has been a bug in the Intel decoder for some time, and it's just that we are seeing more paths in the OS that use the fully hardware-accelerated path. Currently we are seeing this on HD5000 and Iris (HD6000, etc.) It does not happen for us with HD4000 or NVIDIA. If this goes on for a while, we might be able to make f.lux force the hardware acceleration off, but we'd really prefer not to do that because of battery life/etc. I have the same problem on my MacBook Pro (Retina, 15-inch, Mid 2015) with Intel Iris Pro 1536 MB. The problem appears exactly as described by other users. Thanks @AnMartini hopefully the right people will be able to fix it soon. I came to this forum to report the same issue... but it seems I'm not alone! I have a MacBook Pro (Retina, 13-inch, Late 2013) with a Intel Iris 1536 MB and my issue is exactly same as described above. I am currently running 10.11 Public Beta 15A278b and I can confirm the issue is not resolved. edit: I can also confirm issue is present is safari and quicktime, but not chrome and VLC. must be related to some video hardware decoding apple apps are able to take advantage of third party ones aren't? Areas of images with the same colour seem like they're getting heavy codec-compression. Issue occurs with video playback both in VLC and over web browsers. Get artifacting on "bright" areas of video when in fullscreen of youtube. what's strange is that if I watch the video not in fullscreen the artifacting isn't there. Even stranger is that if I wiggle the mouse while watching a video so that the timeline shows the artifacting will go away temporarily while in fullscreen video. but once the timeline bar disappears it comes back. if I force the graphics card to change to the discrete card (Nvidia GeForce GT 650M) there is no artifacting at all. So it must be with the discrete graphics card. I also get the artifacting when watching videos on Vimeo in Safari, even when not on fullscreen. Weird colours and artifacts as described by others in the thread on full screen YouTube when there are no play controls showing. Weird that it doesn't also happen when the video plays in a window. I have noticed the problem in fullscreen quicktime too. Exactly the same issue, I now leave my mouse cursor on youtube pause button on fullscreen to avoid it. Some people may be able to fix this by locking the discrete card (via http://gfx.io) and using that for video. We are noticing that if a video is re-encoded with Quicktime the problem does not appear, but Youtube and Netflix appear to have "out of gamut" video that presents this overflow. For everyone with a single Intel card, we may be able to do a workaround by drawing a tiny transparent icon over the corner and preventing full hardware acceleration, but I avoid hacks like this until everything else fails! Since it only has a single Intel card, would you be able to provide a workaround for people like me? Is anyone still seeing this on 10.11? Our test machine is showing that it has improved the problem considerably (sometimes there is still a strange blue glow). @lorna I still see the same blue glow and its still quite distracting. @lorna Definitely not fixed in newest released update. Also, is there a way to update from within flux or do we have to check for new updates periodically, then download and replace the old version? @seajay We have autoupdates but we only push them when we know they are ready to go, so the download link at justgetflux.com will always be up to date. So 36.4 is the most updated one, but it hasn't had any change to the video (this is all on Intel). So if you've updated to OS X 10.11 you may see some improvements. OK good to know, thank you! They fixed the awful bug that was in darkroom and basically couldn't reproduce the other bug with blue everywhere - there was an improvement on my Macbook Air but it wasn't fully gone. Is there any specific content you can send us (ok to send me a chat) that it always happens on? @lorna oh wait I guess I'm referring to the artifacting and not the blue mouse. I don't notice the blue mouse problem here on this video. should I move my video suggestion thing to another thread that's more about artifacting? @lorna Hahaha yeah, it's just one that I was watching for a research paper and kept getting the artifacting problems. @lorna okay yeah so this video every time gives artifacting as well as the blue mouse bug. This is quite frustrating. I prefer Safari because of the interface and how efficient it seems to be; watching a video in Chrome or Firefox uses up about 70% CPU whereas it is barely noticeable in Safari. Flash-based videos are fine but Youtube Center no longer lets me force the player type so I'm basically stuck using a non-preferred browser if I still want to use flux. First-world problems I know but still frustrating. @dsquareddan I am also doing the same. But it is getting tedious to always do so, when I watch a series of tutorials in a row. Any luck fixing this? The same issue I reported and someone did too in another topic. This only happens with Safari. I watch videos in youtube in nightime with Chrome and it's ok. But already happen to me while watching Netflix through a new mac app (beta) called Smartflix. @herf Is there any chance that you could release the transparent icon workaround on the forums until the driver is fixed? I'd much rather lose some battery life than be unable to watch videos in fullscreen. 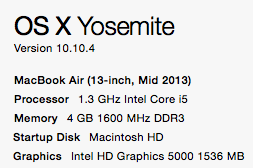 I'm using an early 2014 MacBook Air so the Intel HD Graphics 5000 is my only video card. I also have the issue on all hardware accelerated video. Computer is a mid-2013 MacBook Air with HD5000. this issue is not happen in chrome! I can do the overlay in Chrome (where it doesn't help) but in Safari it creates a whole new desktop (fullscreen app through Mission Control) and is quite intent on making that the only app. It might be possible with a Safari extension, but it wasn't as easy as I thought! Also if you're seeing this on Youtube or somewhere we can test, please post a link. This stopped failing on 10.11.1 on our Macbook Air (HD5000). Same issue here : MBP 13" mid 2015 osx El Capitan 10.11.1 using Safari, however, i dont have any blue fringed blue color on my mouse. So, the only way i found to avoid this bug is to let my mouse cursor on the the play button of youtube. @herf Still happening on my Macbook Air (HD4000) w/ 10.11.1. seajay's youtube link earlier is a perfect example because of the white background right at the start. Hi macbook air core i7 intel hd 5000 here and with El capitan 10.11.2 The last update i've just did the blue glow is here before i had no problem. So sadly i decided to uninstall Flux 'cause the blue glow was very very annoying. I hope you guys can solve it! Same here. Macbook Air 13, 2013, HD 5000. Still no fix. Macbook Pro Retina Mid 2014 13". Intel Iris 1536MB graphics.. Having the issue as others have reported. Very obvious on this video https://www.youtube.com/watch?v=z3HvchF49AM. It's been months since this thread was started.. is there still no fix?